Years ago, when Jenny and Marsha started StarDust Celebrations, they made a pact that if – and at the time, that was a big IF – their sons ever got married, they would plan each other’s son’s wedding celebrations. Fast forward to early this past spring when on a brisk day, Marsha and Bob received a phone call from their son Jonathan, asking them to join him and his girlfriend Angela at the Arboretum. He invited them under the guise that he was going to propose to Angela, so imagine the Frenches’ shock when they arrived to find they were just two of a handful of family-only guests to attend Jonathan and Angela’s surprise wedding! While the couple wanted a tiny, simple ceremony, they were open to a larger, more elaborate reception celebrating their marriage. So Jenny, and her right-hand assistant, Staci Freeman, set to work helping Angela plan the event she envisioned: a sweet yet elegant, family-centered dinner party. 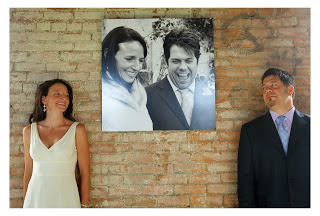 The celebration was to be a compilation of their children, their community, nature and their friends and family. 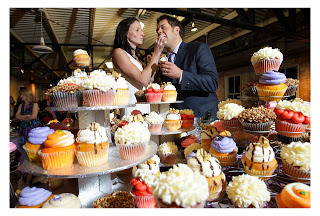 The couple has a restaurant (State and Allen Lounge) so amazing food would also be an important element. The delectable station-style dinner was provided by Savory, the restaurant’s catering arm. One other element would cement the whole theme together – green. Green is a way of life for Angela and Jonathan, and their restaurant has earned numerous accolades for the company’s efforts to create a positive impact on the environment. 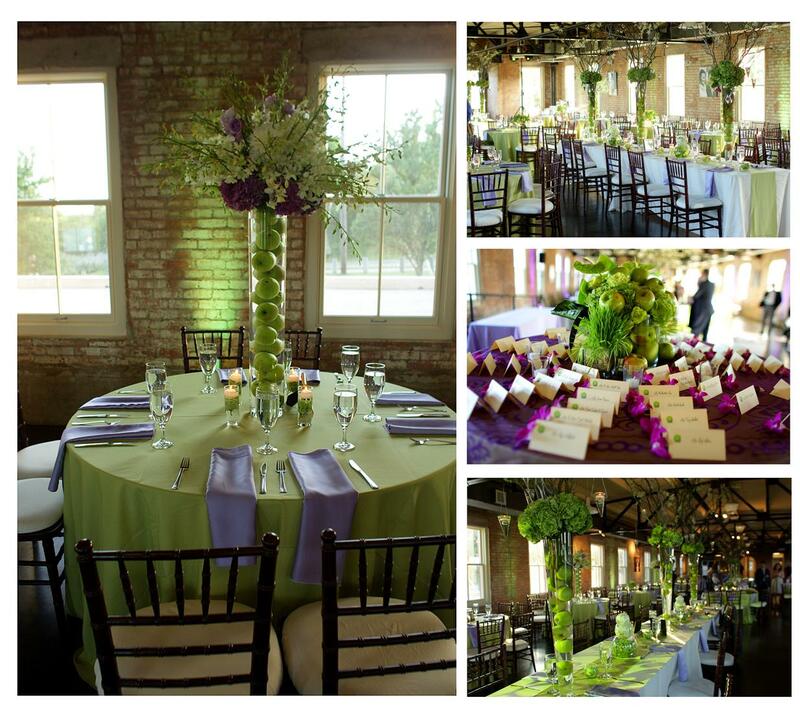 So, not only were some of the wedding elements environmentally green, but green also served as the main color for the reception’s theme. As you can see in these fabulous photos by the talented Gary Donihoo and Kym Skiles of f8studio, the results were just beautiful. The reception was held at the historic Filter Building on White Rock Lake, in the community where the couple lives and plays. 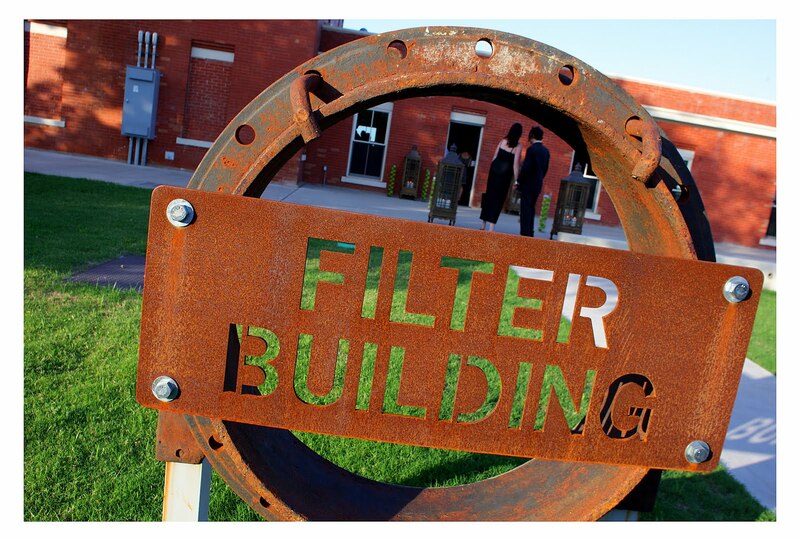 The cool, funky Filter Building is just across the lake from the Arboretum, where Angela and Jonathan “eloped”. The location overlooking the lake and the vintage industrial vibe lent an urban elegance to the celebration that was just the right style for this hip, casual couple. The space was transformed by a juxtaposition of banquet and round tables with Chivari chairs brought in by M&M Special Event Rentals. 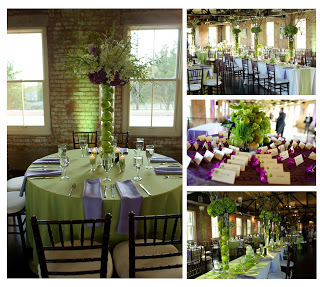 Junior Villanueva of The Garden Gate dressed the tables with lilac and apple green lamour linens. 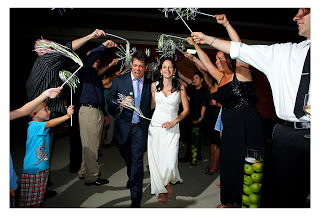 The green theme was punctuated by bushels of Granny Smith apples, bouquets of green hydrangeas and punches of bright pink and purple scattered throughout. Tommy Evans, DJ and owner of Specialty Sound, arranged the lovely lighting that finished the space design with warmth and softness; Tommy also kept guests of all ages on the dance floor by playing casual, lively music throughout the evening. 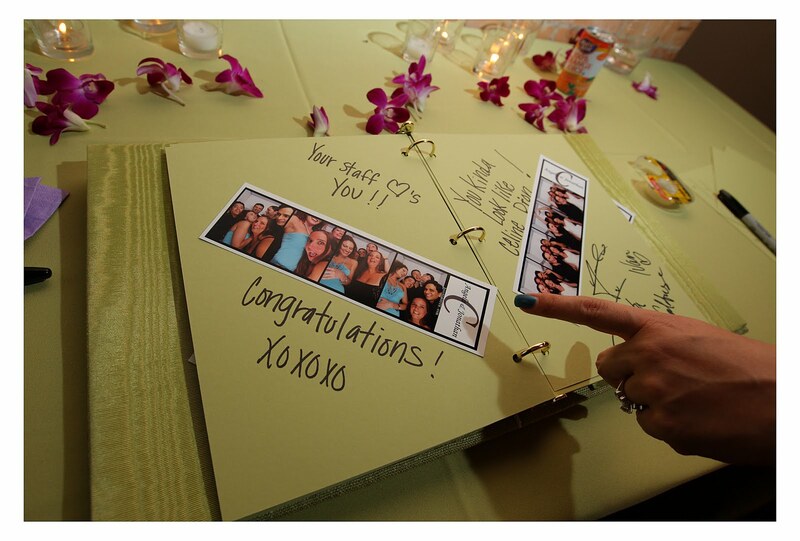 The couple wanted something more fun than just the traditional guestbook so they brought in a photo booth for guests to have pictures made to put into Angela and Jonathan’s bright green photo album along with some thoughtful words. Because children are very important to Angela and Jonathan, the tables were named after children in their families, including the three they have between them. Also in a nod to the kids (and the young at heart) in attendance and their free-spirited style, the couple chose whimsical cupcakes in a multitude of colors and flavors as their wedding dessert. 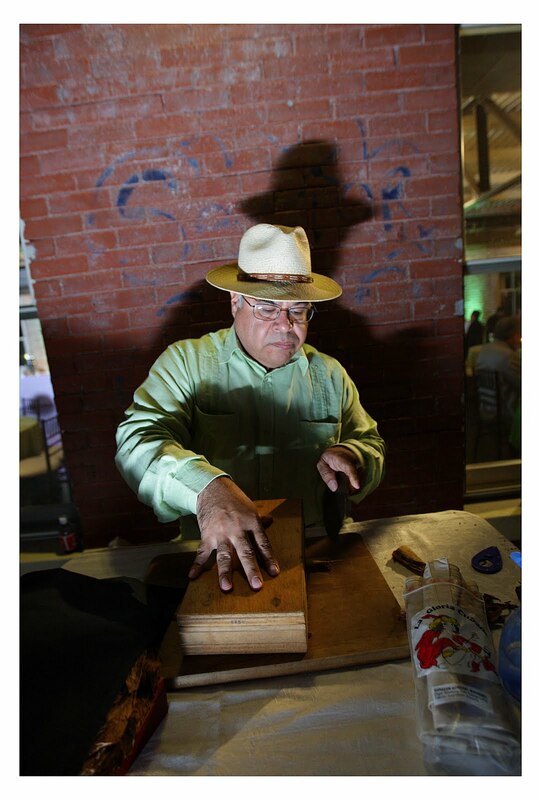 As the evening grew dark, a more grown-up touch appeared on the outdoor terrace when a professional cigar roller started hand-rolling cigars in the traditional Cuban fashion for guests to enjoy. On their way out, guests were presented with delicious favors of caramel green apples Angela and her friends had made. And in keeping with the eco-friendly theme, the couple was sent off with streamers attached to wands, leaving no litter left behind after their departure. This was truly a family affair all around, as Angela and Jonathan were surrounded by their loved ones in a celebration that was uniquely them – full of love and laughter, good food and dancing…and a touch of green!